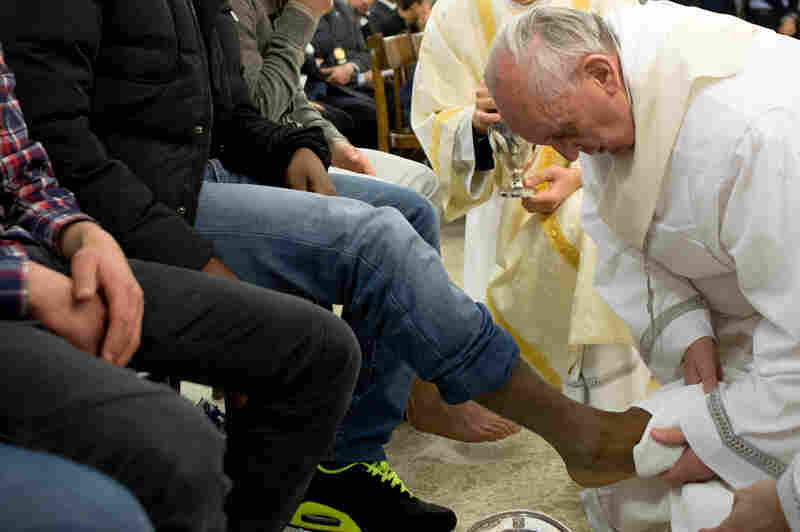 Humble Gestures Are New Pope's Symbol Of Service Pope Francis surprised many this week by washing the feet of young inmates in prison instead of priests in a grand basilica. The ceremony emulates the way Jesus washed the feet of his 12 disciples. On this Easter weekend, we consider the meaning behind Pope Francis' break with tradition. Pope Francis washes the feet of a prisoner at the Casal Del Marmo Youth Detention Center during the mass of the Lord's Supper on Thursday in Rome. Other popes have carried out this rite on Holy Thursday. It is a ceremony to emulate the way Jesus washed the feet of his 12 apostles at the Last Supper, just before he was tried and crucified. But previous popes have washed the feet of priests in Rome's grand, golden St. John Lateran Basilica. Pope Francis went to a penitentiary to wash the feet of prisoners. They ranged in age from 14 to 21; many have had rough lives of struggle on the streets of Rome. The young offenders wore prison-issue jeans, and you could see tattoos on the ankles of a few when they inched up their pants so their feet could be washed by the pope, and dried with a plain towel before he kissed them. "This is a symbol, it is a sign," Pope Francis told them. "Washing your feet means I am at your service." A few of the inmates were reportedly Roma. A few were Muslim. And two were women, which attracted attention because it seems to violate what are called "liturgical norms." But when Francis was the archbishop of Buenos Aires, he often washed the feet of prison inmates and patients in hospitals, including women. It would have been possible for Pope Francis to undertake some study to eventually issue a liturgical decree to announce a change in ritual. But instead, as Father Charles Faso, a Franciscan friar in Chicago told us, "Pope Francis just did it. As Jesus 'just did it'...by touching people and talking with people who were excluded by law from human touch and care." Before it was regarded as a ritual, foot washing was a civility in many cultures. Gracious hosts would give their guests water to rinse their feet from the rigors of the road, even where water could be rare. But unwashed feet could be unlovely and rough; the job was often delegated to slaves and servants. So it was not just ritual for Jesus to wash feet — or care for those who were ailing, imprisoned or infirm — but a real act of comfort and mercy that had poetic strength. Father James Martin, the Jesuit priest, told us that Pope Francis kneeling to wash and kiss the feet of young inmates, including women, "speaks volumes about his priorities ... there was another person who was critiqued for setting aside rules," he says, "to extend compassion to others. And that person is the man whose death and resurrection we remember this weekend."